An ellipse is a geometric shape that results from viewing a circular shape in perspective, or from a different vantage point. In simple terms, an ellipse is an oval. Depending on the vantage point of the viewer, an ellipse results from the distortion of an object that is circular in shape. As a geometric element, an ellipse has many definitions. As artists, we need not get too concerned with the mathematic elements of an ellipse. We simply need to know how to draw one accurately. First we'll look how an ellipse works. As mentioned before, an ellipse is the result of viewing a circular object from any vantage point other than "straight on". 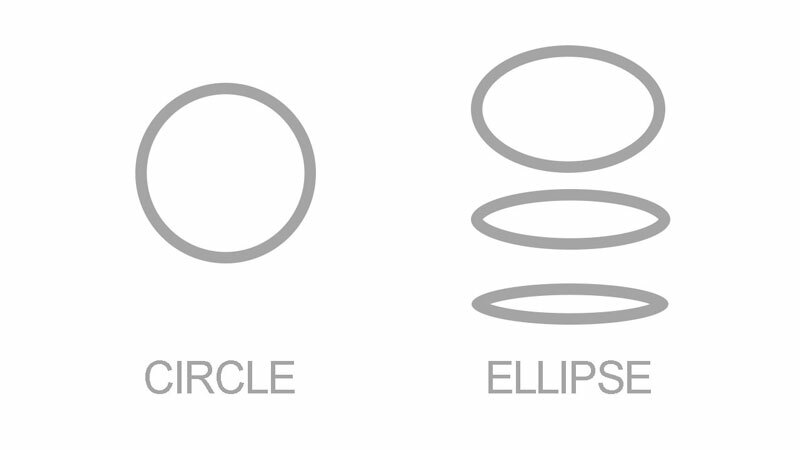 Since there are many objects that are circular in shape, ellipses will be used quite frequently in our drawings and paintings. Any circular shape can cause issues for an artist. It can be difficult at times to create smooth curvatures that are evenly balanced. For this reason, we can use a few methodologies to help us draw ellipses to a higher degree of accuracy. The three approaches we'll look at here include drawing freehand, using one point perspective, and using two point perspective. Each method is explored further below and a few photo references are included for practice. The easiest and quickest method for drawing an ellipse is simply drawing it freehand. However, this method is less accurate and does require a bit of "guesswork". For most applications, drawing an ellipse freehand will be the best approach. For more technical layouts (or artists), perspective may be used. For each method, we'll create a structure in which to draw the ellipse. When drawing freehand, we'll first draw two overlapping lines that intersect at the midpoint of the shape. We'll then determine the height and width of the ellipse marking these locations with a small dot. Using these dots as a reference, we can draw the ellipse. To help develop a smooth curve, the shape is drawn "from the shoulder" and several loose lines may be drawn in order "to find the right mark". Since an ellipse usually results from viewing a circle in perspective, it makes perfect sense to use linear perspective to help us draw one. The vanishing point is placed on the horizon line after its location has been determined. Two lines of perspective are drawn receding to the vanishing point. The distance in which these two lines are placed apart from each other will determine the width of the ellipse. The height of the ellipse is established by two horizontal lines that cross over the lines of perspective. The result is a "square" drawn in perspective that will be used as a guide to draw the ellipse. Next, the midpoints of the "square" are determined. A vertical line is drawn from the center of the bottom line receding towards the vanishing point. A horizontal line is drawn across the middle of the "square". These two lines will intersect at the middle of what will become the ellipse. Next, points are marked in the locations where these lines meet the edges of the "square". These points will be used as a guide to draw the ellipse. Using these points, we can draw an accurate ellipse. Two point perspective can also be used to draw an accurate ellipse. Here again, we'll start by establishing the horizon line. But this time, we'll place two vanishing points. Two sets of lines are drawn receding to each of the vanishing points. These lines will intersect, creating a "square" in perspective. We'll next determine the midpoints and draw lines receding to each of the vanishing points. The locations in which these lines intersect the edges of the "square" will determine the points that will used to draw the ellipse. These locations are marked with small dots. These points are then used as a guide to draw an accurate ellipse.